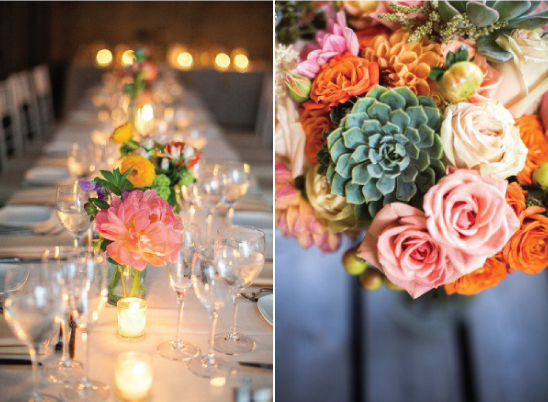 I will never tire of bright florals combined with softer hues in the same colour scheme. Add to that neutral decor accent detail like napkins and candles and it will almost always make your flowers pop. My favourite bright and colour combinations are coral, tangerine, green and pink. There is not a lot of people that would not feel happiness and warmth when looking and sitting at a table filled with these colours. That is certainly an aim when designing a table scape – happiness, love and joy. Early on when I started designing weddings I fell in love with using floating candles. Not only does it give you the freedom to add lightning at different heights without using a lot of wax but also to incorporate water onto the table. In addition to also having a calming effect, it adds height to a table scape without obscuring the view across the table that have your guests playing hide and seek all night. I can’t imagine anything worse for guests than not being able to see over flower arrangements candles. Not only can guests not see each other, they can probable not see the bride and groom when seated and that is a definite no-no. As the weather in the Southern Hemisphere starts to cool down I start to dream of the bright weddings being planned for the new wedding season chasing away chills and inviting in happiness and warmth.